I wish I could understand just why, oh why, Scandinavians have such good style. I think one day I'll have to go on a research trip to thoroughly investigate this enigma. 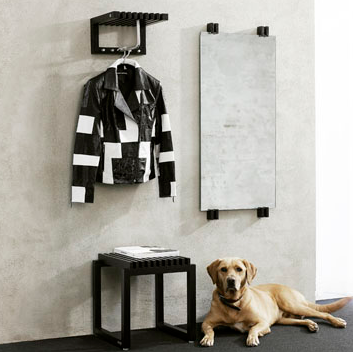 While I'm there, I can interview Niels Hvass and ask him how came up with this really cool, simple and functional "Cutter Mini Wardrobe" piece of storage furniture. I want it! The wardrobe has a hanger rail, four hooks and a place to store your hat. I actually have been looking for a place for my hat! Thanks, Niels! 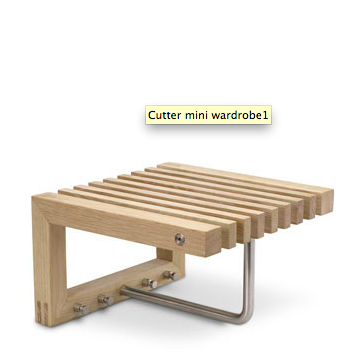 The Cutter Mini Wardrobe is made in Denmark of teak, black stained teak and/or oak. And it costs around $210. Now to find out if this is sold in the good old red, white and blue.